Note: This is a slightly revised and excerpted version of a document prepared in support of the application by the Dogpatch neighbors to receive historical district status, which was officially designated by the City in 2003. Through the lens of Dogpatch’s nomination as a local historic district, this article delves into the area’s history, examining the presence of various key industries and the regional development patterns that they represent. Beyond its regional significance as a center for industry, Dogpatch became the primary neighborhood for the area’s industrial workers, and its integrity as an important example of working class residential architecture from 1870-1930 has led to its recent local historic district status. Dogpatch is an approximately nine-block enclave of industrial workers’ housing located east of Potrero Hill, in San Francisco’s Central Waterfront district. The neighborhood is comprised of almost one-hundred flats and cottages, as well as several commercial, industrial and civic buildings, most of which were erected between 1870 and 1930. The neighborhood is significant under National Register Criterion A (Patterns of History) and Criterion C (Design/Construction). The neighborhood is significant on the local city level under Criterion A, within the category of Industry, as the oldest and most intact concentration of industrial workers’ housing in San Francisco. No other district of San Francisco or California was industrialized to the degree of Potrero Point during the last quarter of the 19th Century. The shipyards and other maritime-related industries of Potrero Point required a steady supply of inexpensive immigrant labor in an area that was geographically cut off from the rest of the city. Local developers and landholders, including Santa Fe Land Improvement Company, filled this need by constructing rows of inexpensive cottages and selling individual parcels to laborers and their families, allowing the neighborhood to develop as an informal company town. One of the clusters of Pelton cottages, this on Tennessee Street, in Dogpatch. Dogpatch is also significant on the local level under Criterion A, under the category of Exploration/Settlement, as the first housing developed in the Potrero District. Initially developed in the early 1870s, Dogpatch became the nucleus of the Potrero District that would evolve after the 1906. Finally, Dogpatch is significant under Criterion C as a moderately intact district of mostly Victorian and Edwardian-era era workers’ dwellings constructed between 1870 and 1910. 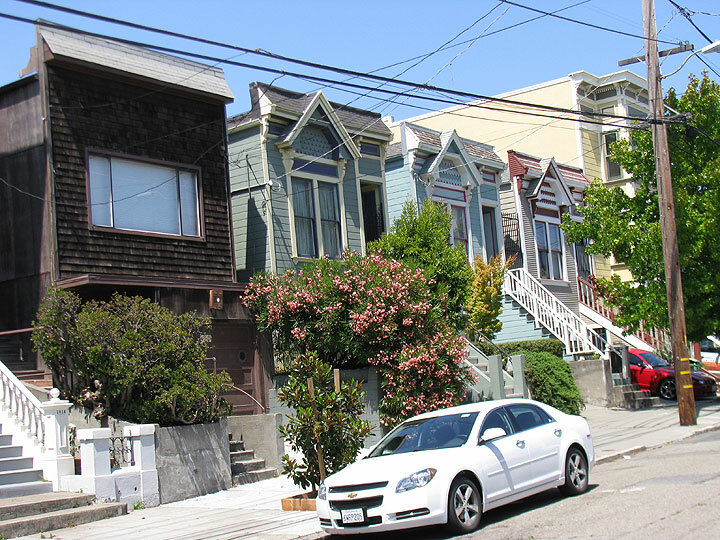 The district has several clusters and pairs of identical dwellings, including a group of thirteen identical Eastlake-style cottages based on the plans of San Francisco architect John Cotter Pelton, Jr. While the significance of Union Iron Works/Bethlehem Steel is national, the significance of Dogpatch is local. The period of significance for the survey area dates from 1867, the opening of Long Bridge and the beginning of construction in the neighborhood, to the end of World War II. What is now Dogpatch has a long record of human history dating from the local Native American residents of pre-European contact days to the present day. From 1776 until after the end of Spanish rule in 1821, all of Potrero Hill was used for grazing by at Mission Dolores to rear livestock for the Mission and the military garrison at the Presidio of San Francisco. In 1833 the Mexican government secularized the missions of Alta California. Although partly intended to free the indigenous people of California from peonage, the concurrent patenting of vast ranchos by the Mexican government resulted in the division of Mission Dolores’ land amongst the powerful descendents of the original Spanish settlers. All of what is now Potrero Hill, including Potrero Point, became part of a vast ranch known as Rancho Potrero de San Francisco, or simply Potrero Nuevo. Potrero Nuevo was granted to the sons of Francisco de Haro, the first alcalde of San Francisco and its boundaries were the same formidable natural features that have traditionally isolated the neighborhood from the rest of the city. Potrero Nuevo was ideal pasturage as it needed little fencing due to the presence of considerable natural boundaries, including Mission Creek to the north, San Francisco Bay to the east, Islais Creek to the south and the western escarpment of Potrero Hill to the west. In the years following the American conquest of California in 1846 the settlement of Yerba Buena (renamed San Francisco in 1847) was largely confined to a several-block area surrounding Portsmouth Square. Although the Gold Rush pushed settlement south of Market Street to Steamboat Point, access to Rancho de Potrero Nuevo was hindered by the shallow tidal flats of Mission Bay. Nonetheless, this geographic isolation did not stop squatters from attempting to settle the steep slopes of Potrero Point, a 100’-tall arm of Potrero Hill that projected eastward into the Bay. In 1849, John Townsend and Cornelius de Boom unsuccessfully attempted to establish a settlement on De Haro’s land at Potrero Point. This first attempt proved to be unsuccessful due to the remoteness of the site and conflicting land claims. February 1852—U.S. Coast Survey Map. At the time of this topographical survey, Potrero Point at the bottom of the map shows no buildings or economic development at all, making it well suited to the early explosives manufacturing that sited there soon after. Within only five years of California’s admission to the Union in 1850, Potrero Point’s destiny as the most important zone of heavy industry on the West Coast had already been established. 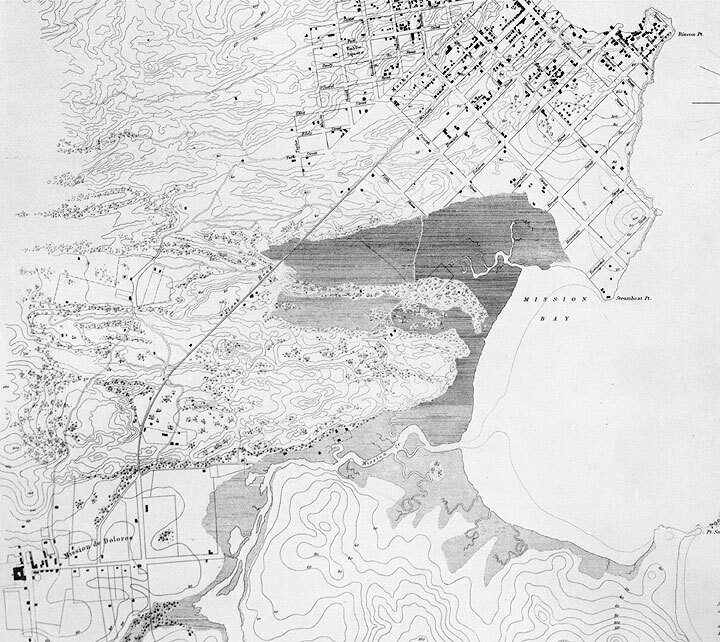 The 1852 Coast Survey map, the first official government map to depict Potrero Point, showed no buildings in the area now occupied by Dogpatch but within two years this situation changed dramatically. Increased population pressures, combined with a new city ordinance forbidding dangerous industries from being located anywhere near settled areas, compelled certain industries such as gunpowder manufacturers, to move beyond the city limits. Due to its remoteness and abundant deep-water anchorages, Potrero Point was earmarked as the ideal location for relocating essential gunpowder manufacturing operations. Such operations were needed in San Francisco to manufacture black gunpowder, which was used for hard rock mining in the Sierras and for city street grading. In 1854, E.I. du Pont de Nemours Company, one of the largest manufacturers of black gunpowder in the United States, constructed their first powder magazine on the West Coast on the south shore of Potrero Point near the corner of Maryland and Humboldt Streets, now the site of P.G. & E.’s Potrero Power Plant. Within a year, Hazard Powder Company constructed a second gunpowder manufacturing facility on 23rd Street, between Maryland and Louisiana Streets. The 1857 Coast Survey map shows that both operations were located on the south shore of Potrero Point, adjacent to wharves constructed for loading kegs onto ships. The gunpowder manufacturers remained at Potrero Point for about twenty-five years until the expanding city limits of San Francisco and encroaching residential districts on Irish Hill and Dutchman’s Flat compelled them to move on to more congenial locations. By 1881 both companies sold their plants to Claus Spreckels and moved to rural Contra Costa County. 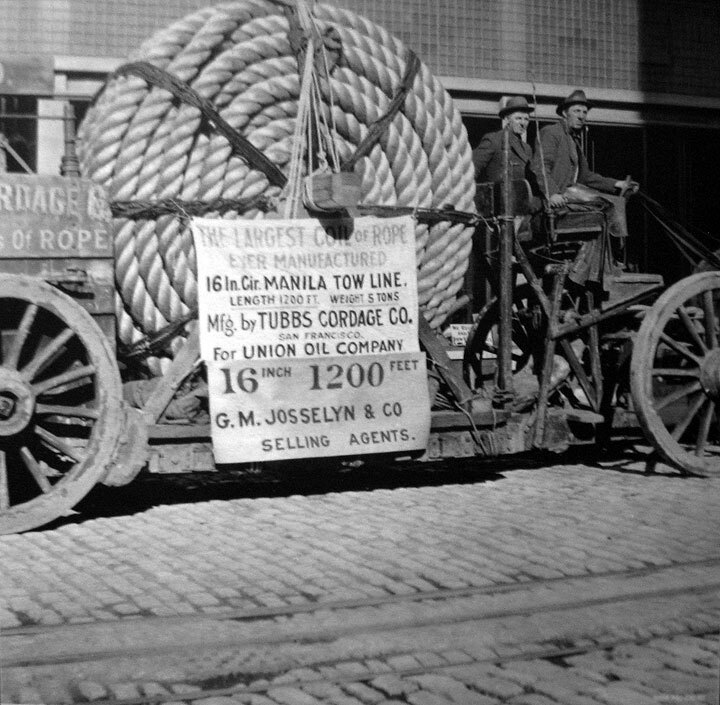 Massive ropes made at the Tubbs Cordage Company. Even before the completion of Long Bridge in 1867, maritime-related industries in search of large tracts of vacant land and deep water anchorage began joining the gunpowder manufacturers at Potrero Point. The earliest of these pioneer industries was a rope-making factory established by brothers Alfred and Hiram Tubbs called San Francisco Cordage Manufactory. After procuring the necessary machinery and hiring skilled laborers, the Tubbs brothers acquired a parcel of open land near the south shore of Potrero Point. At this location the company started producing rope in 1857 and soon they were selling it to ship riggers and mining companies throughout the Western United States, Mexico, Peru, China and Japan. The works embrace several acres of land at the Potrero covered by immense fireproof buildings of brick and iron and which are all tile covered. In these structures the highest type of machinery that can be obtained for making cordage is in operation, showing the whole process of manufacturing every class and size of cables from the huge one, nine inches in circumference, to the one but a quarter of an inch in diameter, and including all of those products of manilla (sic) or sisal which enter so largely into the useful and mechanical requirements of the day. The material finds its way from the Philippines or Yucatan by shiploads and comes to the works in its raw state, whence, after careful manipulation, both by hand and machinery, it leaves as the perfect fabric, to be distributed along the Pacific Coast and as far south as Mexico and as far to the north as the adventurous whalers ascend and east to Salt Lake. The magnitude of the works can be estimated by a consideration of the fact that a 500 horsepower engine is required to drive the machinery and that 250 hands, all white, labor, and embracing men, boys and girls, always find constant employment at fair wages." San Francisco City Directories reveal that Tubbs Cordage Company remained a major manufacturer in San Francisco and employer in Dogpatch from the late 1870s until the San Francisco facility was shut down in 1962. Within the next twenty years, the complex was gradually demolished and in 1978 the last remaining buildings were replaced by a San Francisco Municipal Railway bus yard. Following the establishment of San Francisco Cordage Manufactory at Potrero Point in 1856 the industrialization of Potrero Point began to greatly intensify, particularly with the arrival of maritime-related industries in search of large parcels of land with deep-water access. In 1862 John North, San Francisco’s most prominent shipbuilder, led the way by relocating his shipyard from Steamboat Point on the northern edge of Mission Bay to a large site near the foot of Sierra Street (now 22nd Street) on Potrero Point. Other boat and ship builders such as Henry Owens, William E. Collyer and Patrick Tiernan followed North to Potrero Point. The construction of boatyards began to change the landscape of Potrero Point. The 1869 Coast Survey map shows five wharves and shipways along the rugged coastline of Potrero Point, two blocks east of what is now Dogpatch (Figure 2). 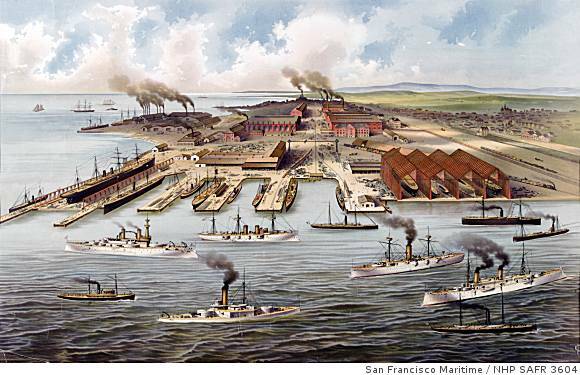 The early ship yards illustrated the potential of the district as a major ship building center, a realization not lost on the owners of Union Iron Works and other major San Francisco manufacturers. Most important to the history of Dogpatch, the boat yards began to attract a significant residential labor force to the area. The earliest surviving dwelling in Dogpatch was constructed in 1872 for a boat builder named William J. Thompson. He was employed by a local boat builder on Illinois Street called Locke & Montague. In anticipation of the completion of the transcontinental railroad in 1869, speculators flush with dividends from the Comstock mining boom began to invest in unimproved residential and industrial lands at Potrero Point. Due to its deep water access and inexpensive land, industrialists purchased large tracts of land in the area that now comprises Union Iron Works and Dogpatch. Nonetheless, speculators faced several significant natural obstacles that would have to be overcome before large-scale industrial development could occur. First, the foul-smelling expanse of Mission Bay, a large tidal flat separating Steamboat and Potrero Points, needed to be bridged to make access easier from downtown, as well as to increase land values. The first pilings for Long Bridge were driven off Steamboat Point in February 1865 and the Potrero connection was completed at near Mariposa Street in 1867. Long Bridge was extended, via Kentucky Street, across Islais Creek to Bayview in 1868. The completion of Kentucky Street across Potrero Point was only accomplished through massive blasting efforts, which were needed to remove portions of a large vein of serpentine rock that connected Potrero Point with the rest of Potrero Hill. In this first major alteration of the physical shape of Potrero Hill, over 100,000 cubic yards of rock were removed. Within a few months of the bridge’s completion, horse car lines operated by the Potrero and Bayview Railroad were in operation on Long Bridge, connecting downtown San Francisco with Potrero Point for the first time in its recorded history. Railroads played a decisive role in the physical development of Potrero Point and what is now Dogpatch during the last quarter of the 19th century and the first half of the 20th century. Perennially the most powerful forces in California politics, the Southern Pacific and the Atchison, Topeka & Santa Fe Railroads exerted their political muscle in Sacramento to acquire valuable industrial lands on Potrero Point, as well as the submerged “water lots” of Mission Bay. In 1869, during the construction of Long Bridge, both railroads acquired most of Mission Bay from the State in exchange for filling and developing the expansive tidal flats. Simultaneously the Atchison, Topeka & Santa Fe (under the aegis of their real estate arm, the Santa Fe Land Improvement Company), acquired much of the rugged Potrero Point peninsula, including the acreage that now comprises the northern and central parts of what is now Dogpatch. In true form the railroads made out like bandits and dragged their feet in fulfilling their commitments. Southern Pacific did not finish filling their sections of Mission Bay until 1901 and Atchison, Topeka & Santa Fe did not complete their filling operations until 1903. Potrero Point remained an important base of operations for both railroads into the 20th century. The Southern Pacific used Kentucky Street as their right-of-way from their wharf on the Bay to their station South of Market and constructed a tremendous roundhouse on Mariposa Street at Minnesota. The Atchison, Topeka & Santa Fe’s tracks followed Indiana Street from their mole south of Potrero Point to downtown. Santa Fe Land Improvement Company held onto their Dogpatch, which consisted of sections of Blocks 4043, 4060, 4061, 4106 and 4107 until the Second World War. Ownership of the land was essential to the company who actively quarried it as a source of landfill and later as a commodity to be developed with housing or industrial buildings. In addition to building a row of duplex cottages along the 800 block of Minnesota Street, the Santa Fe Land Improvement Company built two large brick warehouses which still stand in Dogpatch, including the former Schilling Wine Warehouse at 900 Minnesota and the former Hulme & Hart Wool Scourers warehouse at 800-50 Tennessee Street. The old Schilling Wine Warehouse (red bricks at left), later owned by Esprit de Corps clothing, has now been converted to condominiums. Simultaneous to the construction of Long Bridge, several newly organized capitalists began jostling with the railroads to acquire tracts of land on Potrero Point. On May 10, 1866 Pacific Rolling Mills was organized by the industrialists William Alvord, John Bensley and D.O. Mills. In that year they successfully received a grant of submerged land north of Potrero Point from the State Legislature. Alvord, the president of Pacific Rolling Mills then purchased approximately twenty acres on the north shore of Potrero Point and began building wharves and buildings at the foot of Napa Street (now 20th Street). In July 1868 Pacific Rolling Mills began producing rolled steel, the first product of this kind on the West Coast. Pacific Rolling Mills turned out about 30,000 tons of iron and 10,000 tons of steel annually and gradually specialized in the manufacture of rails, locomotive parts, marine and engine forgings, bolts, nuts, railroad spikes, track nails, washers and coil chains. In 1882 historian J. S. Hittell described the conditions of employment for the largely immigrant workforce. The higher wages paid by Pacific Rolling Mills and other early industries of Potrero Point were essential in attracting a local labor supply, many of whom began to settle in Irish Hill, a serpentine outcropping south of the mill not yet blasted away for the mill. In the mid-1890s Pacific Rolling Mills was renamed Risdon Iron & Locomotive Works and the company changed its emphasis to building gold dredges, which had been invented by the company in 1897. In 1911 Bethlehem Steel bought out Risdon and merged the plant with their adjacent San Francisco Yard. Unpredictably, the completion of the transcontinental railroad in 1869 unleashed an economic downturn in San Francisco, as local industries suddenly found themselves unable to compete with a flood of inexpensive Eastern manufactured goods. Land values, bid up by speculators over the past decade, collapsed. The development of Potrero Point temporarily halted. Nonetheless, surviving industries began to recover by 1871, partially as a result of an influx of cheap immigrant labor from Eastern cities. In 1871 the State of California began to auction off the remaining tidelands surrounding Potrero Point to various industries. Despite another slump that lasted from 1878 to 1884, the industries of Potrero Point continued to expand. The Coast Survey Map of 1883, the first since 1869, showed that San Francisco Cordage, the boatyards and Pacific Rolling Mills had been joined by other industries including: Arctic Oil Works, Southern Pacific Cattle Yards, Atlas Iron Works, San Francisco Gas Light Company (later known as San Francisco Gas & Electric, California Sugar Refinery (later known as Western Sugar Refinery), California Barrel Company and Union Iron Works, the major employers of Dogpatch residents. From the late 1880s until the end of the Second World War Union Iron Works was the most important industry on Potrero Point and the largest employer of Dogpatch residents, employing anywhere between a quarter to half of the neighborhood residents. It was also the most important manufacturing industry in San Francisco and the West Coast during from the latter half of the 19th century until the First World War. Union Iron Works was founded in 1849 by the brothers Peter, James and Michael Donahue and although little more than a blacksmith’s shop, the business was the first iron works established on the West Coast. In 1862 the company became known as Donahue Iron & Brass Company and a few years later, when H. J. Booth, Irving M. Scott and George W. Prescott joined the firm-the Union Iron Works. The pioneer firm soon became the most important manufacturing firm in the West. In 1865 Union Iron Works built the first locomotive on the West Coast for the San Francisco-San Jose Railroad. Within the next decade Union Iron Works was manufacturing 90% of the heavy machinery used by mining companies working the Comstock Lode. By 1865, Donahue had sold his interest in the Union Iron Works and for the next ten years, the company was known as H. J. Booth & Co. In the early 1880s, H. J. Booth & Co. was reorganized under the management of partner Irving Murray Scott and renamed Prescott, Scott & Co.
One of Scott’s first major accomplishments was to purchase 32 acres of land with deep-water frontage on the north side of Potrero Point and in 1883 he oversaw the construction of the new Union Iron Works plant at Potrero Point. The total cost of the shipyard came to approximately $2,000,000, an exorbitant sum for the day. 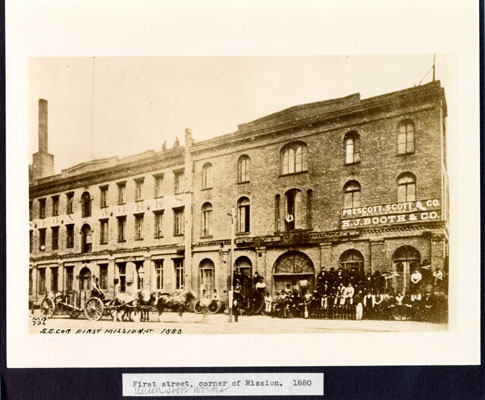 The buildings, which were designed by a civil engineer named Dr. D. E. Melliss, included a boiler shop, a blacksmiths’ shop, riveting and erecting shop (Building 112), machine shop (Building 113), a 120’ chimney, a brass-plating shop, an iron foundry and a pattern shop. 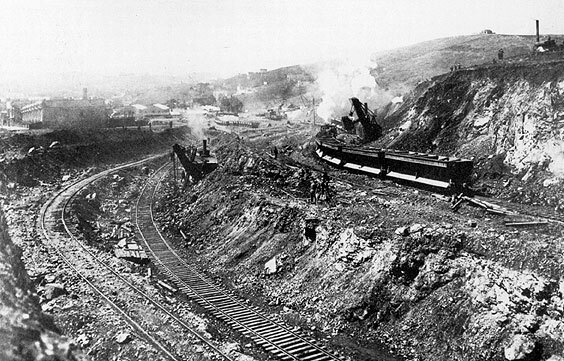 The shipyard was connected to transportation lines via a Southern Pacific spur line and the physical site was expanded through fill operations that involved removing rock from Irish Hill and dumping it in the Bay. Finally, shipways, cranes and long wharf were constructed to handle virtually any sized ship. Gradually, Union Iron works bought out its nearby competitors at Potrero Point, including Atlas Iron Works and Risdon Locomotive Works. Recognizing the growing demand for steel hulled ships Scott decided to branch out from the company’s traditional emphasis upon railroad and mining equipment to ship manufacturing. The first ship launched at the new Potrero Yard in April 1885 was the collier Arago, a steamer of 800 tons. Nonetheless, it was not peacetime merchant vessels that would make Union Iron Works the largest shipyard in California and the dominant manufacturing facility on the West Coast. The ambitious expansion of the U.S. Navy in the late 1880s and 1890s inspired Scott to bid on Navy contracts, coming into direct competition with major East Coast shipyards. The first military contracts completed by Union Iron Works were the battle cruisers Charleston and San Francisco, which were launched in 1888, the first cruisers launched on the West Coast. However it would be the legendary cruiser Olympia and the battleship Oregon (launched in 1893) that would forever seal Union Iron Works’ reputation for building great warships. 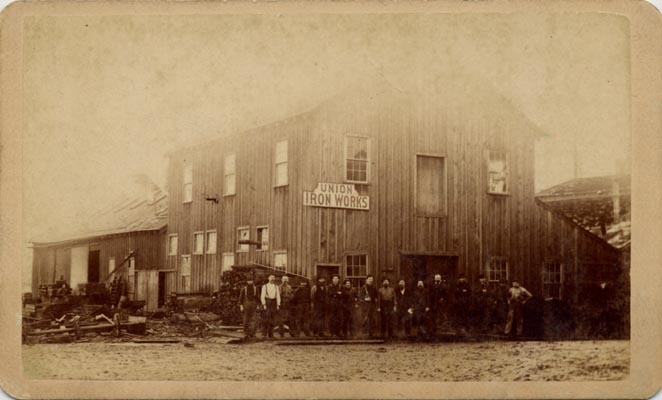 Workers outside early Union Iron Works building at Potrero Point, c. 1880s. In 1896 Irving Scott retained the firm of Percy & Hamilton to design a new drafting house for the shipyard (Building 104). In the decades that followed, Union Iron Works launched down its ways battleships and armored cruisers as large and heavy as any major shipyard in the world. One of these ships was the USS Ohio, one of the biggest battleships of its era. President McKinley, Irving M. Scott’s close friend, presided over the laying of the keel in 1899. Much to the pride of the Dogpatch/Irish Hill communities, McKinley was escorted to the keel laying by a group of schoolchildren from the Irving M. Scott School. Much to the chagrin of eastern shipyards, Scott took advantage of a preferential bid-price formula designed by the federal government to encourage shipbuilding on the West Coast. As a result, Union Iron Works gained a healthy share of the contracts that led to the creation of the Great White Fleet, the symbol of American Naval might that Theodore Roosevelt would send around to the ports of all nations. In 1902 the United States Shipbuilding Company, a trust headed by Lewis Nixon and Charles Schwab, acquired Union Iron Works, as well as seven other major shipyards in the nation. After the company went into receivership Charles M. Schwab successfully bid $1,000,000 for the Union Iron Works on behalf of Bethlehem Steel, at a public auction in 1905. Schwab appointed Joseph J. Tynan as the new superintendent of Bethlehem Steel’s San Francisco Yard, as Union Iron Works was renamed. In 1911 Bethlehem Steel purchased Risdon Iron & Locomotive Shipbuilding Works (formerly Pacific Rolling Mills) and added them to the San Francisco Yard. The following year, the San Francisco firm of Weeks & Day was hired to design a new powerhouse for the plant along the main 20th Street frontage. Charles Schwab had been appointed by President Wilson to serve as the director-general of the Emergency Fleet Corporation and he steered several major Navy contracts to the San Francisco Yard in the years leading up the First World War. In 1916 the shipyard was expanded physically with a $100,000 reinforced-concrete foundry building which necessitated the demolition of Irish Hill in order to construct it. The next year, a new administration building was constructed on the northeast corner of Illinois and 20th Streets. In 1918, one year after the United States entered the First World War, the San Francisco Yard constructed 18 submarines, 10 of which were for Britain, and 66 destroyers. On July 4, 1918, 8 destroyers were launched in one day to join the U. S. Navy. By 1918 the San Francisco Yard employed 10,000 workers and the total sum of laborers employed at all of Bethlehem Steel’s yards in the Bay Area (including the Alameda and Hunter’s Point shipyards) was 25,000, making it the single largest ship producing complex in the world. With peace in 1918 came a collapse in shipbuilding at Bethlehem Steel’s San Francisco Yard, which lapsed into semi-dormancy. Nevertheless, between 1919 and 1938 shipyard constructed 142 vessels, including submarines, oil tankers, freighters, ferries, and passenger and freight ships. With the revival of interest in the merchant marine, the plant was modernized in 1938. During the interwar period there was also some limited warship construction, including two destroyers: the McCall and the Maury. In 1938 the shipyard was renamed the San Francisco Yard. 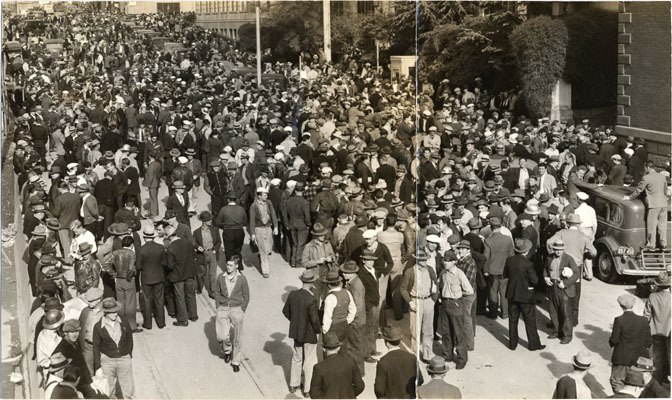 During the 1930s and 1940s laborers in the Potrero Yard, many of whom lived in Dogpatch, struck for higher wages. Striking machinists outside the Bethlehem Steel Company plant at 20th and Illinois Streets, May 12, 1941. After the outbreak of war in 1941 disputes were put aside as the shipyard began operating at full capacity when it employed 18,500 workers during round-the-clock shifts. During the Second World War Bethlehem Steel expanded the Potrero Yard facilities in anticipation of the fifty-two warships, troop transports and other war-related vessels that would be constructed during the next four years, not to mention the 2,500 repaired or converted vessels, ranging from tugs to 32,000 battleships. Among the ships overhauled included the SS Nieu Amsterdam, the Navy troop transport Montecello (formerly the Italian luxury liner Conte di Savoia), the 25,000-ton aircraft carrier Essex and the battleships: USS California, USS Maryland, USS Mississippi, USS Nevada and the USS Pennsylvania. There is no portion of San Francisco where the work of ‘the mighty hand of man’ is shown so plainly, perhaps, as in that district known as the Potrero. Elsewhere within the city’s boundaries vast changes have been brought about...work was strictly that of development. But here it is far different. The pioneers of progress at the Potrero, have had first actually to create the very ground upon which have been erected those vast establishments that have given to the district its name and fame as the very foremost center of mechanical industry and wealth-producing enterprises upon the Coast. Where the massive factories now stand solidly along the level shore, which bristles with its rows of piers, was once but a choice between precipitous hillsides, along which a goat could scarcely make his way, and oozy foul-smelling marshes, a mere glance at which would seem sufficient to have utterly discouraged the most progressive combination of energy and capital. Great stretches of craggy bluffs have disappeared. Vast masses of rock have been blasted away from the hillsides and thrown upon the marshes. Thousands and thousands sunk into the depths and left no trace, but a time came at last when the vast dumping process had its effect, and the solid earth appeared above the surface. The mountain had perished! That portion it was necessary to remove so that the great manufactories could take root – and with the mountain had gone the marshes. 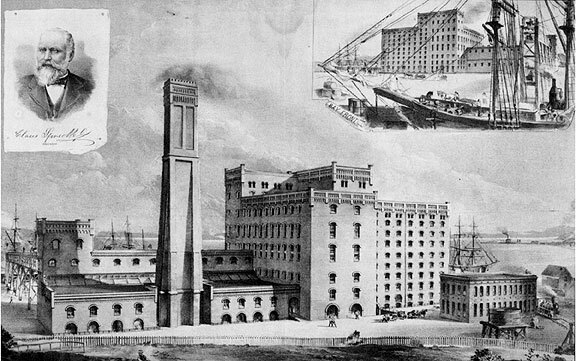 Allowing that the factories were built, the mills and docks erected, communication with the city established – this, in itself a herculean task – here still remained the problem of housing the great armies of workmen, without whom the wheels and the hammers and the forges must forever remain useless and silent. All could not come from a distance and on those bleak and almost inaccessible hillsides there seemed no more chance for human habitations than upon the low-lying, repulsive and tide-swept marsh. And about the centers of industries which flourish, so to speak, the lifeblood of what has now come to be the vigorous young community, has grown up the town. More and more of the hillsides were leveled down; more and more of the marsh built up into high and solid ground. Pathways, alleys and finally broad streets and avenues were graded through or up the slopes, and such of the bigger acclivities (sic) as were allowed to remain were terraced and graded and made the sites of numberless cosy (sic) homes. As the industries of the place grew and the necessity for more building ground, both for business purposes and homes, increased, the streets were carried further, though in many instances at least, at almost incredible toil and expense, and more favorable locations were opened up. The residential districts that sprang up at Potrero Point constituted the only significant urbanization within the entire Potrero District. The 1883 Coast map shows that most of Potrero Hill was still rural, consisting for the most part of a handful of large ranches. When San Franciscans referred to the “Potrero” after the 1870s they meant the industrial zone along the bay and the residential enclaves of Irish Hill and Ductchman’s Flat/Dogpatch. During the late 1870s, the flats west of Kentucky Street on Potrero Point were beginning to coalesce into a secondary district of industrial workers’ housing. The 1869 U.S. Coast Survey map reveals that there were a few structures located within the survey boundaries of Dogpatch, especially along Tennessee and Kentucky Streets (Figure 2). Most of the other structures appear to have been dwellings or commercial structures with flats above. There were also several community buildings on Kentucky Street, including the Potrero School (1865), Olivet Presbyterian Church (1869) and the Kentucky Street Methodist Episcopal Church (1871), indicating the existence of a separate viable neighborhood. The 1883 U.S. Coast and Geodetic Survey map indicates that by this year several new clusters of houses had been constructed on both sides Tennessee Street, between Mariposa and 19th Streets (Figure 3). The 1886 Sanborn Fire Insurance map, the first to cover the Potrero district, illustrate that Dogpatch had blossomed into a growing residential neighborhood with clusters of two-family flats, workers’ cottages, saloons, shops and two churches. The residences were located in two separate clusters along Tennessee Street; the first clustered around the intersections of Solano (18th Street) and Tennessee and Sierra (22nd Street). The first description of Dogpatch (then called Dutchman’s Flat) appeared in the August 11, 1889 edition of the San Francisco Examiner. The residence portion of the Potrero may be said to be divided like ancient Gaul, into three parts, the “old town” is that first divided, mentioned as crowning the heights above the waterside factories, and the principal means of gaining access to which are long flights of stairs (Irish Hill). Another section is that which has also been referred to as lying to the southwest in the valley next to the cordage factory (Dogpatch). The density of residential development in Dogpatch remained sparse in comparison with Irish Hill until the early years of the 20th Century. Reasons for the relatively uneven level of development in Dogpatch include the fact that much of Dogpatch was occupied by large outcroppings of serpentine and second, that much of the northern part of the neighborhood was owned by the Atchison, Topeka & Santa Fe railroad, an organization not particularly keen to sell off their holdings for residential development. According to Census schedules and anecdotal evidence, Dogpatch and Irish Hill retained very separate identities during the 1880s and 1890s. According to the US Census schedules, Irish Hill was inhabited almost exclusively by unskilled and semi-skilled Irish immigrant laborers who worked at Pacific Rolling Mills or Union Iron Works. The prevalence of residential hotels and saloons in Irish Hill reflected this state of affairs. Most of the first residents of what is now Dogpatch were American-born skilled craftsmen in the boatyards or as foremen at San Francisco Cordage or Pacific Rolling Mills. According to local tradition there was also an influx of German laborers into the young neighborhood around 1880, giving the area its early name of Dutchman’s Flat. 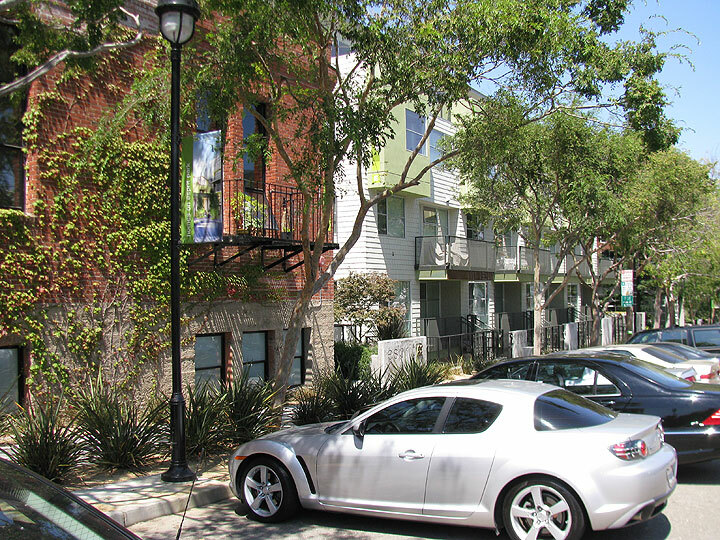 Several of the oldest surviving dwellings in Dogpatch, such as 718 22nd Street or 707 18th Street reflect the early history of the neighborhood. The Italianate-style dwelling at 707 18th Street was constructed in 1876 by Frederick S. Castner, a gardener and carpenter and the dwelling at 718 22nd Street (formerly Sierra) was constructed in 1872 by William J. Thompson, an American-born boat builder employed by Locke & Montague, one of the oldest boat yards on Potrero Point. The demographic makeup of Dogpatch was transformed between 1880 and 1890 from a predominantly American-born population of skilled craftsmen and foremen to a more varied population of various European ethnic groups. As Census records for the district are either unavailable or illegible, listings in city directories and other sources of information help to fill out the socio-economic picture of the neighborhood. From these sources it can be determined that Irish-born residents comprised close to half the population by 1890. During the early days of Union Iron Works, a relatively small percentage of residents worked in the shipyard. Large numbers of neighborhood residents worked in a variety of the industries of Potrero Point, including Pacific Rolling Mills, San Francisco Cordage Company and Western Sugar Refinery. By the end of the decade the workforce at Union Iron Works expanded to employ more than a thousand men and Dogpatch grew in response as empty lots were graded, subdivided and built up. The construction and expansion of Union Iron Works at Potrero Point was the most significant factor behind the development of Dogpatch in the 1880s and for the next seventy years, the fortunes of the neighborhood ebbed and flowed with the largest shipyard of the West Coast. During the 1880s speculators and individuals built several clusters of Italianate style multi-family flats and cottages along most of the graded sections of Tennessee Street, particularly at its intersections with Sierra (22nd Street), Butte (19th Street) and Solano (18th Street). One of the most significant clusters of surviving dwellings from the 1880s is located on the 1100 Block of Tennessee Street. In 1885 architect Michael J. Welch and builders O. E. Dunshea and Thomas Sullivan designed and constructed a row of four identical Italianate flats for the Sullivan family (1104-06, 1108-10, 1112-14 and 1116-18 Tennessee). Three years earlier Martin Phelan had commissioned a row of six identical flat-fronted Italianate residences on the east side of the 1100 block of Tennessee. Nearly identical to the row on the west side of Tennessee, it is possible that they were also designed by Michael J. Welch. Only two of the original row (1109-11 and 1113-15 Tennessee) remain today. Although not built as a group, another row of Italianate style multi-family dwellings went up along the west side of the 700 block of Tennessee, including 694 Tennessee (1884), 700 Tennessee (1883), 724-26 Tennessee (1886), and 730-32 Tennessee (1885). Upon the gentle slopes to the northward are numerous blocks of cottages or more ambitious residence structures, amid which stands the large public school building, which certainly does not suffer by comparison with those within the better-known districts of the city. From 1890-1900 the population of Dogpatch continued to evolve, becoming an increasingly foreign-born and working-class in character. According to the 1900 Census, 45.8% of the 72 households in the survey area were Irish-born. German-born residents came in second with 25% and American-born residents ranked third with 13.9%. Other ethnic groups represented in the neighborhood included: Danish, Swedish, Japanese, Scottish, Welsh and Norwegian. According to the 1900 Census, 38.9% heads-of-household were homeowners and 55.5% were renters. Occupational backgrounds of neighborhood residents varied greatly according to the 1900 Census. Union Iron Works had become by far the largest private employer of Dogpatch residents. According to the 1900 Census 25% of the heads-of-household were employed as laborers, platers, riveters or in other categories at the shipyard. Ranked second after Union Iron Works were residents employed as itinerant laborers. This category, which comprised 18.1% of all heads-of household, consisted mostly of day laborers, teamsters and tradesmen. In third place were residents employed by Market Street Railway. This privately operated streetcar operator which predated the municipally owned San Francisco Municipal Railway, employed 15.3% of neighborhood residents, mostly as conductors and gripmen on cable car lines throughout the city. In 1900 12.5% of neighborhood heads-of-household were proprietors of local businesses, such as saloons, grocery stores and butchers. In fifth place was Western Sugar Refinery, which employed 11.1% of neighborhood residents. Other employers of local residents included San Francisco Fire Department, Pacific Rolling Mills, Atlas Iron Works, California Barrel Company, Tubbs Cordage Company and San Francisco Gas & Electric Company. Roughly half of the surviving historic dwellings in Dogpatch were constructed between 1890 and 1900. The dramatic growth of Dogpatch reflected citywide and national trends that were fueled by the twin phenomena of mass foreign immigration and urbanization. In the fifty years between 1850 and 1900, San Francisco had grown from a tiny rural settlement into the nation’s eighth-largest city and the second most important port, second only to New York in foreign trade. At Potrero Point, Union Iron Works won several important contracts from the U.S. Navy to build warships, including the USS Charleston in 1888, the USS Oregon in 1893 and the USS Ohio in 1900. The expansion of operations at Union Iron Works increased the demand for labor. Although public transit allowed workers to commute to Potrero Point from elsewhere in the City, the district was still relatively isolated from other residential districts. The crest of Potrero Hill was as yet sparsely populated due to lack of transit and water. In order to satisfy the demand for workers’ housing in close proximity to the iron works, speculators and individuals built a wide variety of workers’ housing, ranging from a cluster of sixteen single-family “Pelton cottages” on Minnesota and Tennessee Streets to several large multi-family dwellings on the north side of 22nd Street and infill construction elsewhere. The first decade of the 20th Century was another important period for residential development in Dogpatch. The early part of the decade experienced a slump as ship-building dried up after the conclusion of the Spanish-American War and the receivership sale of Union Iron Works in 1905 Bethlehem Steel. Development in Dogpatch picked up toward the end of the decade as the San Francisco Yard experienced a resurgence in contracts. Perhaps more than the shipyards, the event that caused the most significant increase of population in Dogpatch was the 1906 Earthquake, which brought thousands of earthquake refugees to Potrero Hill. Between 1900 and 1910 the largest single concentration of new residential development occurred in the southwestern corner of the neighborhood when eleven new multi-family dwellings were built on a newly subdivided parcel on the west side of the 900 block of Minnesota Street. The majority of the other dwellings constructed during the decade occurred as infill development on vacant lots. Most of these later dwellings were larger multi-family dwellings designed in the Classical Revival style, such as 1016-18 Tennessee (1901) and 1159-63 Tennessee (1909). The 1906 Earthquake and Fire left approximately 250,000 San Franciscans homeless. Especially hard hit was the working-class industrial/residential South of Market district. After the initial destruction, many of the earthquake refugees made their way to the undestroyed parts of the Mission and Potrero districts where they squatted on parkland and empty lots. A City refugee camp was established on a large vacant parcel in Dogpatch belonging to the Santa Fe Land Improvement Company, which was bounded by 18th Street to the north, Kentucky Street to the east, Kentucky Place to the south and Indiana Street to the west (Figures 5 and 6). By Autumn 1906 the Army tents were replaced with temporary but more substantial two-and-three-room wood prefabricated cabins. These structures were euphemistically called “cottages” by the government but quickly earned the name of “earthquake shack.” After 1906 the South of Market district was rebuilt almost entirely as an industrial neighborhood, with the population of the South of Market declined rapidly, from 62,000 to 24,000. Working-class immigrant families who had dominated the district before 1906 were largely squeezed out. As a result, many South of Market refugees decided to remain in the Potrero, either taking up residence in the older industrial neighborhoods of Dogpatch or Irish Hill or moving their earthquake shacks to the heretofore underdeveloped expanses of Potrero Hill. In many ways the neighborhood that the South of Market refugees moved to was not all that different than the vanished neighborhood they had left. Developed as an extension of the South of Market on the south side of Mission Bay, Potrero Point and Dogpatch was characterized by a mixture of industrial and residential uses. Census reveal that Dogpatch had grown from around 700 people to over 1,000 between 1900 and 1920. It had also become more ethnically diverse after a large influx of Italian immigrants. Between 1910 and 1920, Northern European immigrant groups shrank in proportion to “newer” immigrant groups from Eastern and Southern Europe and the percentage of native-born Americans shrank to a tiny proportion of the population. Irish-born residents and their children still comprised the largest segment of the population although their percentage of the population shrank from 45.8% to 42.6%. The largest decreases occurred amongst German-born residents who shrank from 25% of householders in 1900 to 4.6% in 1920 and native-born Americans who decreased from 13.9% to 6.5% during the same period. Conversely, between 1900 and 1920 the Italian-born population of Dogpatch increased from virtually nothing to around 30.5%, making this group the second-largest segment of the population. According to local tradition, a second major influx of Italians into Dogpatch occurred in 1923 after a fire destroyed Cunio Flats, an Italian community located close to Fisherman’s Wharf. One of the first Italian families to settle in what is now Dogpatch was the Ciccerone Family, who started a grocery store in 1905 at 1204 19th Street. Although Census Schedules for this decade are not yet available, block books, city directories and property sales records indicate that the majority of the property purchases in Dogpatch were being made by residents with Italian surnames by the end of the decade. Between 1900 and 1920 Union Iron Works/Bethlehem Steel’s San Francisco Yard came to increasingly dominate the employment pool of Dogpatch. In 1900 Union Iron Works was already the single-largest employer in the neighborhood, employing 25% of all residents. Related industries such as Pacific Rolling Mills and Atlas Iron Works, which were later absorbed by Bethlehem Steel, employed 2.8% and 1.4% of neighborhood residents, respectively bringing the total shipyard workforce in the neighborhood to 29.2%. Thanks to aggressive wartime expansion, by 1920 Potrero Yard employed 50% of the householders in Dogpatch. In distant second place, comprising 10.2% of the householders, were business owners and various entrepreneurs. Western Sugar Refinery came in third place, employing 7.4% of the neighborhood householders. Itinerant day laborers were in fourth place, comprising 6.5% and in fifth place was San Francisco Gas & Electric with 5.6%. Other employers included American Can Company, San Francisco Municipal Railway, San Francisco Fire Department, Tubbs Cordage Company and Ford Motor Company. From a socio-economic perspective, Dogpatch was becoming poorer as the workforce became increasingly dominated by unskilled laborers. Significantly, between 1900 and 1920 the percentage of homeowners shrank from 40% to 30.6% of the householders. Part of this change can be accounted for by the increasing construction of large multi-family dwellings but it can also be explained by the widespread trend of long-time homeowners moving from the neighborhood but retaining their homes as income-producing property. Between 1910 and 1920 Dogpatch had in effect become a company town for the shipyard. The outbreak of the First World War in Europe and the resulting expansion of Bethlehem Steel’s San Francisco Yard was a major factor behind the growth and development of Dogpatch between 1910 and 1920. Initially America’s role in the War was that of a semi-covert supplier of materiale to the Allies. Early in the War, the San Francisco Yard constructed several submarines for the Royal British Navy, which were shipped through Canada to the Atlantic. Under the leadership of superintendent Joseph J. Tynan, who was appointed Superintendent of the Potrero Yard by Charles Schwab in 1905, production grew by leaps and bounds. Tynan made the Potrero Yard the centerpiece of a shipbuilding complex centered on the Bay Area, which by 1918 had become the largest shipbuilding region in the United States. The San Francisco Yard expanded physically with the addition of vast concrete-frame machine shops in 1916, which resulted in the destruction of Irish Hill. The enlarged shipyard launched hundreds of freighters and destroyers and employed as many as 10,000 men during the War. Many of the wartime workers employed by the shipyard sought housing in Dogpatch and many were taken on as boarders by local families. Nonetheless, between 1910 to 1920 residential construction declined in Dogpatch due to the lack of available land. Of the 85 structures within the survey boundaries surviving from the period of significance, only three were built between 1910 and 1920. The existence of several large outcroppings of serpentine, combined with the continued ownership of much of the northern part of the neighborhood by Santa Fe Land Improvement Company, increased the difficulty of development. Some serpentine outcroppings even blocked city streets. In September 1910 the Potrero Commercial and Manufacturers’ Association and the Potrero Improvement Club made a formal demand to the City to remove a 30’ mound of serpentine that blocked the intersection of Tennessee and 20th Streets, citing persistent neglect of the neighborhood by city officials. Later that year the Department of Public Works dismantled the hill and dumped the rocks in a large, four-block square pool of stagnant water, referred to locally as the “Red Sea.” Private landholders, such as Santa Fe Land Improvement Company began blasting the remaining outcroppings of rock on their land but these large parcels were more valuable as industrial sites and were developed as such. A photograph taken from the roof of Western Sugar Refinery Circa 1917 shows how Dogpatch and much of the 3rd Street corridor appeared (Figure 7). Between 1910 and 1920 the City constructed several institutional buildings in Dogpatch in an effort to cope with the expanding population of the Potrero District. In 1912 City Architect, John Reid, Jr. designed the new Potrero Police Station for the southwest corner of Kentucky and 20th Streets (2300 3rd Street) on what had been an ungraded 60’ outcropping of serpentine. The Potrero Police Station was built the same time as the North Beach Police Station and the Richmond Station, also designed by City Architect John Reid, Jr., in anticipation of the Panama Pacific International Exposition. The Potrero District needed its own police station to cope with the increasingly transient population of shipyard laborers, most of whom were single males. Three years later John Reid, Jr. designed a similarly detailed public hospital for the southern portion of the same lot (2310 3rd Street). The Potrero Emergency Hospital, as it was called, was deemed necessary to cope with the larger number of injured shipyard workers who had little recourse beyond the company dispensary. Within the next decade these two important public buildings were joined on the site by San Francisco Fire Department’s Station #16 at 909 Tennessee Street. By 1910 there were few large industrial parcels remaining in Dogpatch or elsewhere on Potrero Point. Although Santa Fe Land Improvement Company continued to develop some of their remaining parcels in the next two decades, few of these developments exceeded 20,000 square feet. American Can Company was the last major industries to construct a large-scale industrial plant in the largely built-out Potrero Point industrial zone. Early in 1915 the company, the largest manufacturer of tin cans in the United States, purchased a large two-square block tract of land bounded by Kentucky Street on the west, 20th Street on the north, Illinois Street on the east and 22nd Street on the south for $172,000. This parcel, which had belonged to the Crocker Estate, had for most of its history, remained largely vacant and had been most recently a baseball field. The company blasted away the serpentine and constructed a tremendous concrete-frame factory. The factory was completed in June 1916 and it accommodated 1,200 workers, becoming one of the largest employers of workers in Dogpatch during the 1930s and after the Second World War it became the single-largest employer in Dogpatch. American Can Company manufactured tin cans and also canned fruit, employing a large number of women who were reputedly better at the work (Figure 8). Between 1920 and 1930 Dogpatch reached its population peak with more than 1,200 residents but residential construction all but stopped. Of the existing 85 structures built during the Period of Significance only four were built in this decade, including two single-family cottages and two multi-family apartment buildings. By the early 1920s most of the available residential parcels had long since been developed. Although there were several large tracts still vacant in the northern portion of the neighborhood, such as Block 4059 and the northern portion of Block 4107, these tracts belonged to the Santa Fe Land Improvement Company and they were earmarked for industrial development. The 1920s also witnessed the beginning of the era of decline in population in Dogpatch and the Central Waterfront. With the increasingly widespread ownership of private automobiles, workers in the heavy industries of Potrero Point no longer had to live within walking distance of their place of employment. As the need to live in Dogpatch declined during the 1920s, its value as industrial land increased. Beginning in the late 1920s, the remaining large parcels and infill parcels were redeveloped with machine shops and warehouses. Throughout the 1920s and 1930s several formerly residential sections of Dogpatch, particularly along Kentucky and the upper portion of Tennessee were demolished and redeveloped. In the mid-1920s the last major institutional building was erected in Dogpatch: the new SFFD Station #16, which was designed by City Architect John Reid, Jr. and constructed in 1925. This brick firehouse joined at least four other firehouses in San Francisco designed by John Reid, Jr., as well as the Potrero Police Station (1912) and the Potrero Emergency Hospital (1915). The decade between 1930 and 1940 witnessed further transformation in the social and ethnic makeup of the population of Dogpatch. Much of the evidence is anecdotal due to the fact that neither the 1930 nor the 1940 Census schedules are available. Nevertheless, general information can be gleaned from the 1940 Census population tables, giving a somewhat accurate portrait of the population characteristics of the larger community of Potrero Hill. Dogpatch is part of Census Tract L-1, an area whose boundaries roughly correspond with those of the greater Potrero Hill neighborhood. In 1940 there were 9,035 residents in Census Tract L-1, with Dogpatch comprising roughly an eighth of the total. Of the total population of Tract L-1, 66.3% were native-born white and 32.6% foreign-born white, which included Mexicans and other Latin-Americans. The non-white population was 1.1% and consisted primarily of native-born African-Americans. The percentage of foreign-born residents in Potrero Hill was significantly higher than San Francisco as a whole, where only 20.5% of the population was foreign-born. According to the 1940 Census one-third of the foreign-born population of Census Tract L-1 was born in Italy and Italian-born residents and their American-born progeny comprised almost one-third of the entire neighborhood population. American-born citizens of Italian parentage comprised another 20% of the population. Following Italy, the residents from the following nations comprised smaller percentages of the total population: Russia (5.0% of the total population), Yugoslavia (2.5% of the total population) and Mexico (2.2% of the total population). The 1940 Census reveals that Dogpatch was still a solidly working-class neighborhood. The participation rate of male residents in Census Tract L-1 in the labor force was 80.1 %, and 30.3% for women. Employment rates for both sexes were slightly higher than San Francisco as a whole. Of the total 4,085 residents in the labor force in Census Tract L-1, 2,515 were employed in working-class occupations, with 466 listed as “craftsmen, foremen and kindred workers,” 966 as “operatives and kindred workers,” 41 as “domestic workers,” 421 as “service workers,” and 621 as “laborers.” The percentage of working-class residents was undoubtedly higher in Dogpatch than it was for the rest of the Potrero Hill district included in Census Tract L-1. In regard to rates of home ownership, of the total 2,655 housing units in Census Tract L-1, 1,246 or 46% were owner-occupied; 1,303, or 49% were rented and 3% were vacant. As usual, Bethlehem Steel Potrero Yard was the biggest employer in Dogpatch and most of Potrero Hill. Although the trend of suburbanization continued to lure long-time residents away from Dogpatch in the 1930s, the pre-war build-up attracted increasing numbers of transient shipyard workers to the area. By 1930 Dogpatch was “built-out” with no new housing built in the neighborhood until the 1980s. Several factors contributed to the gradual stagnation of the neighborhood, the most important of which was the increasing ownership of private automobiles amongst working-class San Franciscans. Increasingly affordable, automobiles worked more than any other agent to disperse the workers in Potrero Point industries to the blossoming tracts of the Bayview and the Outer Mission districts. Although the population of Dogpatch grew significantly as a result of the World War II build-up at Bethlehem Steel’s San Francisco Yard, no new housing was constructed due to scarcity of material, labor and developable lots. Following the end of the War, the neighborhood began to decline as jobs dried up at the shipyard and as various other industries such as Western Sugar Refinery and Tubbs Cordage Company began closing shop and moving overseas. Between 1965 to 1980 jobs in the Central Waterfront area, which includes Dogpatch, dropped from 16,304 to 11,004, with most of the loss occurring in manufacturing and ship repair. By the late 1960s Dogpatch gradually deteriorated to the point where the San Francisco Planning Department considered demolishing it and rezoning it for industrial uses. Arson and industrial encroachment took their toll, reducing the residential core of Dogpatch to what exists today. The 1980s witnessed a revival of the area, with an influx of artisans in search of inexpensive housing with character. Dogpatch appears to be eligible for listing under National Register Criterion C as a district that displays the “distinctive characteristics of a type or period of construction,” in this case a rare surviving district of industrial workers’ dwellings constructed before the 1906 earthquake. Although very few structures in the neighborhood are individually eligible for listing in the National Register, as a grouping they “represent a significant and distinguishable entity whose components may lack individual distinction.” Although the dwellings in Dogpatch were typically not constructed by the industries of Potrero Point, they served a similar purpose to the company towns that grew up around textile mills in New England and the South. Although individually most dwellings in Dogpatch do not depart significantly from other late-Victorian era neighborhoods, the existence of clusters of identical dwellings in close proximity to industry reinforce the company town comparison. With rare exceptions, the majority of the dwellings in the surveyed area display a moderate level of architectural embellishment indicating the influence of larger national stylistic trends but at a more restrained level, also characteristic of the working-class origins of the neighborhood. Dogpatch is also significant as a surviving remnant of the once-mighty South of Market mixed-use industrial/residential district that was destroyed in the 1906 earthquake and fire. Very few districts in San Francisco, with the exception of parts of the Bayview, show the unique intertwining of industry and housing that was characteristic of San Francisco in the 19th Century. Dogpatch is also significant as representing “the work of a master,” as the location of the single-largest surviving district of dwellings whose design is based on local architect John Cotter Pelton, Jr.’s Cheap Dwellings pattern book. For reasons as yet unexplored the West never experienced the proliferation of company towns that typically accompanied industrial expansion in older parts of the country. When company towns were built in the West, they were typically constructed in remote areas near lumber mills or mines, where no other housing options existed. In urban areas developed during the latter half of the 19th Century housing that sprang up around industries, such as around the Central Pacific maintenance and construction yards of West Oakland in the 1870s, were referred to as “company towns” although the dwellings were constructed by speculators or by individuals and not by the companies themselves. Nonetheless, as in West Oakland, where close to half of the residents worked for the Central Pacific, the residents of Dogpatch were overwhelmingly employed by Union Iron Works and later Bethelehem Steel’s San Francisco Yard. Local landowners such as Jacob and John Reis and the Santa Fe Land Improvement Company constructed rows of identical cottages throughout the neighborhood. The surviving “Pelton cottages” of 903-915 Minnesota, 1002-1014 Tennessee, 997-99 Tennessee and 1011 Tennessee illustrate what became the signature element of a company town: the clusters of identical and inexpensive cottages rented to industrial workers. Other speculators built identical flats for their families and as rental property, such as the four identical Italianate style flats designed by M. J. Welch for the Sullivan family at 1104-06 to 1114-16 Tennessee in 1885 Street or the row of six identical flats built across the street by Martin Phelan two years earlier. Repetitive house designs for company towns was a common phenomenon in eastern textile mill towns and villages. In the Southeast, mill owners built rows of identical “shotgun” houses for their operatives. Architectural variety was not a priority because it was much cheaper to build a series of identical dwellings from a standardized plan. Dogpatch is also significant as a rare surviving example of an era: a Victorian-era mixed-use industrial and residential district. Once widespread, this type of neighborhood was largely destroyed in 1906, particularly in the South of Market district. Of the eighty-five surviving structures constructed within the period of significance in Dogpatch, only ten were built after the 1906 earthquake and fire. Dogpatch was essentially a southward extension of the South of Market but due to its remote location and natural boundaries, it was spared destruction. Although, of course, many Victorian-era neighborhoods were spared in the disaster, most were middle or upper-class areas with little industry, such as Pacific Heights, the Western Addition, the south Mission the Haight and Noe and Eureka Valleys. With the exception of some sections of the northeast Mission and older sections of the Bayview District, there are no other significant areas of mixed-use working-class Victorian neighborhoods in San Francisco. Although on a much smaller scale, Dogpatch shares much in common with West Oakland, a similar district of Victorian-era workers’ housing with industrial uses surrounding it. Unlike more affluent and socially prominent neighborhoods of San Francisco, Dogpatch and other working-class residential districts in San Francisco have escaped the attention of historians. Although chroniclers of San Francisco have provided us with ample information on the important role of Potrero Point's industries within the development of California's economy, they have largely ignored the lives of the workers whose backs provided the labor and whose dwellings lay cheek-by-jowl with the smoke-belching foundries and colossal shipyards. In order to tell the story of Dogpatch it was necessary to rely almost exclusively upon primary sources, including Sanborn Fire Insurance maps, San Francisco Block Books, US Census records, San Francisco City Directories, Spring Valley Water Company records, historic photographs and builders' journals such as San Francisco Architect & Building News. US Geodetic and Sanborn maps were especially useful for ascertaining rough dates of construction for buildings within the district. In order to determine property ownership information, the following sources were consulted: deeds of transfer at the San Francisco Assessor's Office (post 1906 only), San Francisco Block Books (1906, 1923, 1930 and 1947), Spring Valley Water Company Records and Edward's Abstracts. Additional resources used included contemporary articles in the San Francisco Examiner, San Francisco Chronicle, San Francisco Call' and the San Francisco Evening Bulletin. Historic photographs in the San Francisco History Room, California Historical Society, Society of California Pioneers and the Maritime Museum provide additional information on the appearance of Dogpatch and associated areas at various intervals. Finally local residents who have lived in the neighborhood for decades helped to flesh out the skeleton of the neighborhood's history constructed from primary records. Special thanks go out to Mr. Roy Nehart, a third-generation Dogpatch resident who not only remembers everything about the neighborhood's history but also cares deeply about its future. “Genesis of Our Hill,” Potrero View (September 1976), p. 1. Coast Survey Map of 1857. James W. White, “The Business Correspondence of Gibbons and Lammot, Gold Rush, Black Powder Merchants,” California Historical Quarterly Vol. 55, No. 6, pp. 304-5. According to Sanborn maps Tubbs Cordage Company was located on a rural parcel now bounded roughly by Iowa Street to the west, 22nd Street to the north, 3rd Street to the east and 23rd Street to the south. “Tubbs Cordage Company: One of Our Greatest Industrial Plants,” San Francisco Morning Call (May 28, 1893), p. 30. Maria T. Colyaco, California’s Master Ropemakers, (Manila: Manila Cordage Company, 1977). Roger and Nancy Olmsted, San Francisco Bayside Historical Cultural Resource Study, (San Francisco: 1982), p. 191. Henry Langley, The Pacific Coast Business Directory, (San Francisco: 1867), p. 14. Interview with Mrs. C. F. Adams, conducted by Cheryl and Clark Taylor, (May 1964). Christopher VerPlanck and San Francisco Architectural Heritage, “DPR 523B forms for 900 Minnesota, 800-50 Tennessee, 997-99 and 1011 Tennessee Streets, on file at San Francisco Architectural Heritage. J.S. Hittell, Commerce and Industry of the Pacific Coast, (San Francisco: A.L. Bancroft, 1882), p. 682. William Issel and Robert W. Cherny, San Francisco: 1865-1932, (Berkeley: UC Press, 1986), p. 30. In the decade between 1870 and 1880 San Francisco’s population increased from 149,473 to 233,959 according to the Ninth and Tenth Census. Charles M. Coleman, P.G.&E. of California: the Centennial Story of Pacific Gas and Electric Company 1852-1952, (New York: McGraw-Hill, 1952), p. 29. Sanborn Fire Insurance Company map (1899). Twelfth, Thirteenth and Fourteenth US Census (1900, 1910 and 1920). Dan Gutleben, Documents and materials concerning the Western Sugar Refinery on file at Special Collections, Bancroft Library. Franklin Coyne, Development of the Cooperage Industry in the United States, 1620-1940, (Chicago: Lumber Buyers Publishing Company, 1940), pp. 69-70. Twelfth, Thirteenth and Fourteenth United States Census (1900, 1910 and 1920). Robert O’Brien, “Riptides, From Shovels to Ships,” San Francisco Chronicle (October 21, 1949), p. 18. “The New Union Iron Works and the Arctic Oil Works,” San Francisco Daily Morning Call (January 24, 1884), p. 1. Roger and Nancy Olmsted, p. 196. Dewey Traunt, “Guard of Honer,” Jr. Ed. San Francisco Call (November 23, 1912). “Receiver for Union Works,” San Francisco Chronicle (August 18, 1903)p. 16. “Iron Works Preparing for Increased Business,” San Francisco Call (October 24, 1905). Victor S. Clark, History of Manufactures in the United States, 1893-1928, (New York: 1949), p. 141. “Iron Works is to Build an Addition,” San Francisco Examiner (January 16, 1916), p. 1. “Maritime News,” San Francisco Chronicle (June 3, 1918). Bethlehem Steel Company, A Century of Progress, (San Francisco: Bethlehem Steel Company, Shipbuilding Division, 1949), p. 17. “The Potrero as It Is,” San Francisco Examiner (August 11, 1889), p. 14. Robert O’Brien, “Riptides,” Scrapbook, Oral History of San Francisco, Bancroft Library, p. 14. San Francisco Examiner (August 11, 1889). Christopher VerPlanck and San Francisco Architectural Heritage, “DPR 523B forms for 707 18th Street and 118 22nd Street,” on file at San Francisco Architectural Heritage. Margaret Henry, “Potrero Hill History,” prepared for Potrero Neighborhood Bicentennial Festival, 1976. Christopher VerPlanck, “DPR 523B form for 740 Tennessee Street,” on file at San Francisco Architectural Heritage. “Tubbs Cordage Company,” San Francisco Morning Call (May 28,1893), p. 30. Twelfth Census of the United States: Enumeration Districts 72, 73, 84 & 85, 1900. Interview with Edward Cicerone, conducted by Cheryl and Clark Taylor, (May 1964). Interview with Robert Galli, conducted by Cheryl and Clark Taylor, (May 1964). United States Census Schedules (1920). “Potrero Demands Improvements,” San Francisco Evening Call (September 4, 1910). “One Stone Pile Kills Two Birds,” San Francisco Morning Call (November 17, 1910), p. 7. “S.F. Tract Bought for Can Plant,” San Francisco Examiner (January 22, 1915), p. 7. Sixteenth Census of the United States (1940). San Francisco Department of City Planning, “Central Waterfront, An Area Plan of the Master Plan of the City and County of San Francisco,” (1990), p. II.8.5. California Historic Resources Inventory, “Oakland Point District; also Prescott Neighborhood,” 1987, p. 26. Christopher VerPlanck, “Typology of Southern Textile Mill Village Dwellings,” (Washington, D.C.: HABS/HAER, 1997).